So on Saturday morning Hazel had it in her mind that we were going to bake muffins. She came up with this idea Friday night. I slept in (Thank You Steve!! ), which was wonderful and Steve had already fed her some breakfast. But she was determined, so I pulled out a cookbook. 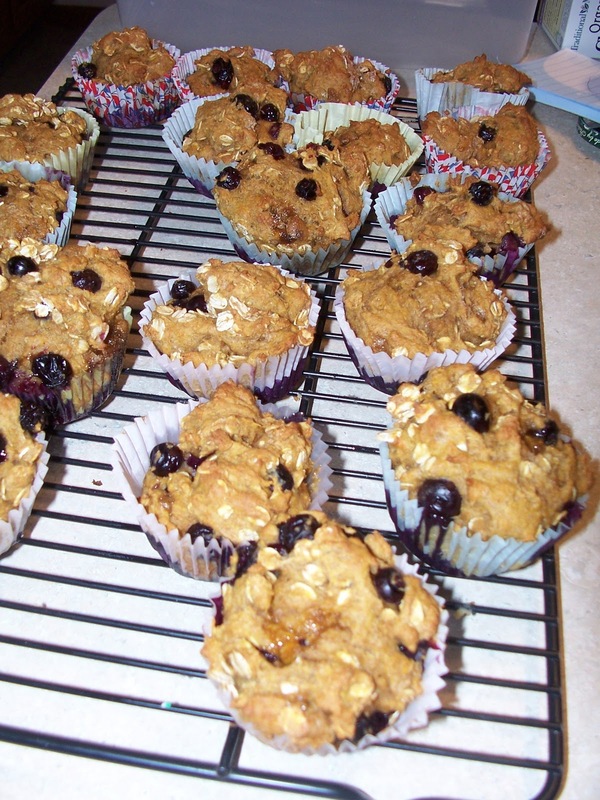 We did not have overripe bananas this time, so we decided on pumpkin blueberry muffins. 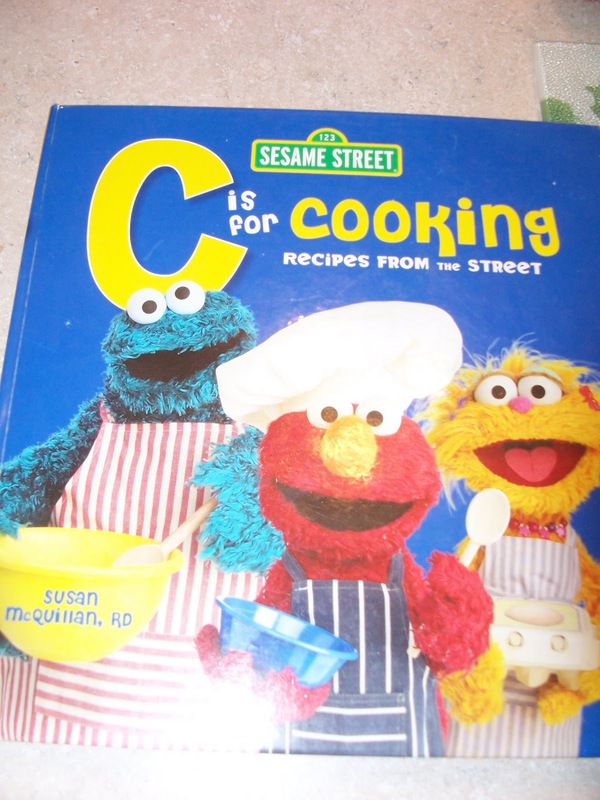 I adapted the recipe from C is for Cooking: Recipes from the Street by Susan McQuillan, RD. It is a cookbook I bought awhile ago for Hazel when we were letting her watch a bit more television and she was so into Elmo. She still loves all the characters and loves the cookbook. The recipes are relatively healthy and very easy. They also mark the parts they consider kid friendly to do. In a small bowl, stir together the flour, baking powder, baking soda, cinnamon and ginger. In a different small bowl, have child crack egg and take out any shells (if there are any). Then beat egg with a fork. In a large bowl stir together sugar and oil. Then add egg, pumpkin, and yogurt and mix until blended. Stir in the flour mixture and oatmeal. Gently stir in blueberries (or raisins or dried cranberries). Distribute batter into the muffin pans filling each to about 2/3. Bake for about 25 minutes. Cool on rack slightly and serve warm. Store in an air tight container for up to 3 days. Yesterday I had a busy day. Do you ever notice how your child seems to grow out of her clothes all of a sudden. Well that happened to us. So I went out yesterday after church to buy Hazel the next size of clothes (which all seem big now). Then I went to tutor, but before I left I got another call about tutoring and planned that one for a few hours afterwards due to the student's work schedule. I tutor about 45 minutes away from home so I try to get them all done at once. Well with two hours to kill, I decided to go shopping. On my way to Target to see about more clothes for Hazel, I saw a fabric store I had been meaning to check out for my mom. Needless to say I spent an hour wandering around and came home with three fabrics. I did show some control since I only bought three. After that I decided I would go to Starbucks and read my book. Well then I remembered the Paper Source and they were still open. Do you know the Paper Source? It is a great store. They have an on-line store as well at http://www.paper-source.com/. I never order on-line but I love wandering around and looking at all the great craft things. They are basically a great store for any paper craft and stationary. 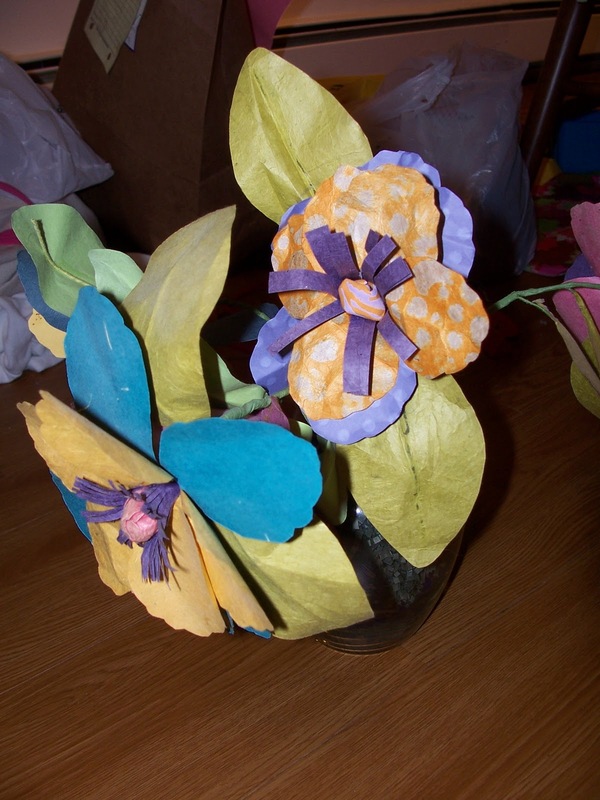 They have beautiful kits for paper flowers (see above) and wreaths as well as ones for kids. It is really a fun store. Well, I found some great scrapbook paper to make some of the wonderful crafts I have seen on this week's Sharing Saturday (there are already over 145 entries and they keep coming). They are pretty similar. I think I will cut double the hearts and have Hazel do one while I do one. 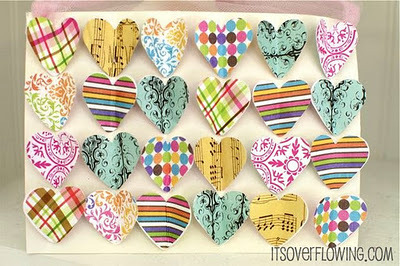 Isn't that heart paper perfect? All I have to do is cut them out. Plus I have the stencil to make other sizes. 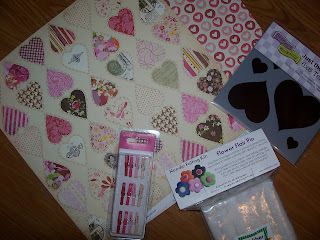 Then the needle felting flower kit was on sale--half price and the clothespins were so cute. I thought I might use them with something from a couple weeks ago Sharing Saturday. 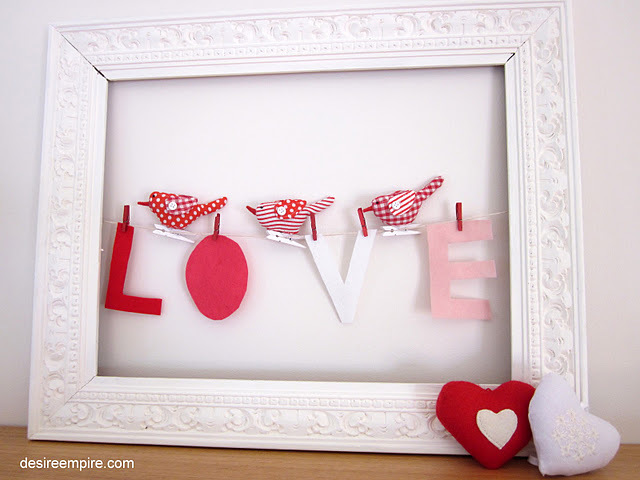 From Desire Empire: Pretty Artwork for a Little Girl's Room. Won't they be perfect? Well I'm so excited to be able to share my purchases with you. I was so excited to buy them and wanted to share them with someone who would appreciate them. Somehow I didn't think Steve or Hazel really would. Hope you have a great day!! Happy Monday! Ps Following you now and I'd love it if you'd follow mw back. Done!! Thank you for following me! The muffins look good. 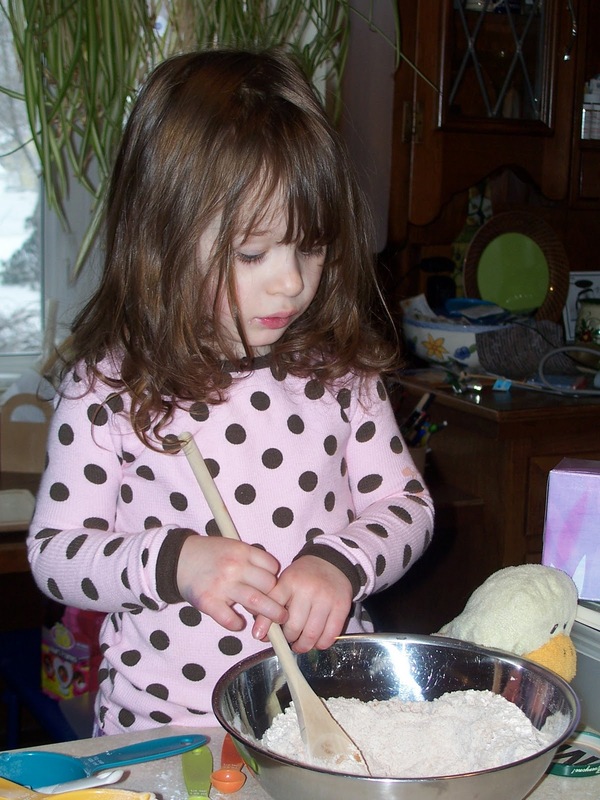 I've seen that cookbook, and wondered about it - good to hear that your little baker likes it! The muffins sound great! I've never thought to put the two flavors together, but it sounds interesting. I just changed out drawers for all my kids today. All was well until I realized Little J's pants looked 2 inches too short, lol! Thanks for sharing at AfterSchool. Love the muffins - they look so yummy. It's dangerous to let me out in the craft store - I always come back with more stuff. Thanks for sharing with Afterschool! Looks like a great recipe, and a fun cook book for that matter. Thanks for sharing on Monday Madness. What a yummy recipe!!! Thank you so much for linking up to Whatcha Making Wednesdays!! !